The present groups were first modelled by Etienne-Maurice Falconet in 1765. Based the play by Taconet of the same title which was performed at Versailles 19 May 1770 upon the occassion of the Dauphin's marriage, the groups were executed by Sèvres for about the next twenty years. 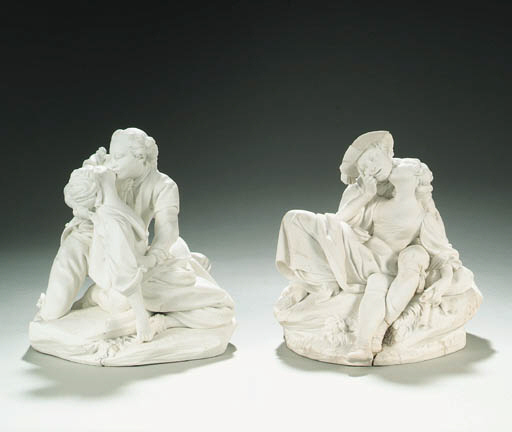 See Aileen Dawson, French Porcelain, A Catalogue of the British Museum Collection, London, 1994, nos. 147/148 for an indepth discussion of the models which sold in 1765 for 144 livres each. See Marcel Brunet and Tamara Préaud, Sèvres des origines à nos jours, Paris, 1978, p. 230, fig. 314 for a similar example of the present model.